Jazz Artistry On Film And Live At The House — And Fun Too. Open Land – Meeting John Abercrombie captures the essence of its subject in both its content and form. The documentary by Arno Oehri and Oliver Primus released on Friday, not only allows the guitarist to tell his story at his own pace, but frames it with uninterrupted long shots, unhurried interviews, and images of open spaces. Abercrombie, who died on August 22, 2017, at the age of 72, recalls his beginnings and his early responses to hearing live sets by John Coltrane (“I thought the mother ship had just landed”) and pianist Bill Evans (“He sounded to me like he should be playing in a cocktail lounge … I didn’t think he was very good. What’s the big deal about this? Years later he became my favorite musician.”). He talks about a rather peculiar encounter with Thelonious Monk; discusses technique (in later years he didn’t use a pick but his thumb, a la Wes Montgomery); and shows how he developed a new composition. We also get a glimpse of his dry sense of humor as we hear and watch him play at a club with his trio, turning a simple song announcement into a hopelessly tangled, absurdist, Monty Python–style explanation. Throughout, Abercrombie comes across as a serious artist dedicated to his craft, creative and thoughtful but also endearingly unassuming. A superior player with a distinct sound and approach, he is praised here for a rare kind of generosity. Drummer Adam Nussbaum, a frequent bandmate, notes Abercrombie’s open-minded and accepting attitude towards others, “and when you have that level of trust with other musicians, that’s when things can happen.” Few walking in on his sessions with students or jamming with friends would immediately identify him as the leader, but still, he sets the tone without calling unnecessary attention to himself. Open Land understands its subject and, taking its cues from Abercrombie’s work, savors beauty in plain-wrapped wisdom, lets stories unfold at their own pace and values silence. Think of it as John Abercrombie’s music for our eyes. Jesse Jones Jr. with James Cottman, drums; Paul Shewchuk, bass; and Brian Murphy, keyboard; at the Historic Hampton House, Miami, Friday. Perhaps conjuring the spirits of the masters that once passed through the historic Hampton House, in Miami, in his early set Friday, saxophonist Jesse Jones Jr. and his quartet offered a wake-up-the-dead serving of soul-jazz and hard bop that probably would not have been out of place at the House in its heyday. Now, that’s the way to celebrate a rebirth. Jones, who as he reminded the audience, played the Hampton House as a youngster, has a round, muscular tone and can, in the arc of a solo, go with ease from abstraction to church and back. Friday he did with casual elegance. On his alto, he suggested a crooner or a soul singer one moment (he also sang vocalese throughout the set) and unspooled probing boppish lines the next. He set the tone early, paying tribute to Ft. Lauderdale native Cannonball Adderley, Jones’s inspiration and once a House regular, with a scorching “Del Sasser,” before moving on to Horace Silver’s “Song for My Father” and Oscar Pettiford’s classic “Bohemia After Dark,” another Cannonball favorite — and we were off. 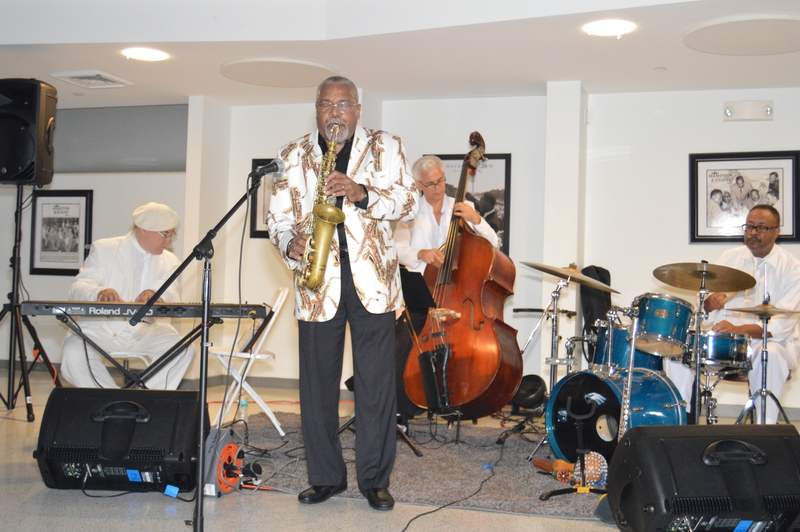 The show was part of the first jazz series of the newly reopened House and it was well attended. In fact, by the look and sound of it, more than a few neighbors and old customers seemed to have come by to check the place, enjoy the music and perhaps relive good times. Clearly at home, Jones didn’t need much encouragement to turn the set into a house party. I can’t remember when was the last jazz show in which I heard the audience giggling, going back and forth with the artist and in fact, actively engaging both the players and the music. Sometimes it seems so long ago, but jazz was once popular music and, dare we say it? fun.